Above: The performance of Sugarman at Injartnama, 1996. Photo courtesy Craig San Roque. Craig San Roque in his essay ‘A Book of Sand’ – appended to the graphic novel The Long Weekend in Alice Springs – writes about the psychic potency of connecting to what lies beneath. San Roque is an analytic psychologist, writer and another important cultural go-between in Alice. 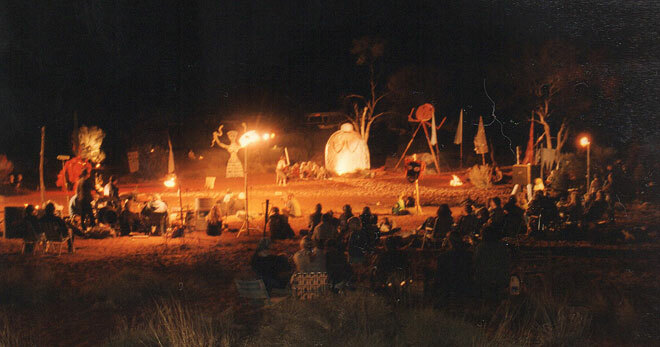 Those of us who’ve been here for a while will remember his Sugarman, a long narrative poem that was also a program of arts and ideas, held at Injartnama (an outstation near Ntaria / Hermannsburg) in 1996 and at the Araluen Arts Centre in 1997. Its highlight was the theatrical production (above) of the same name, with its breakthrough story from the Western classical tradition – the myth of Dionysus, god of fertility and wine – offered into the local grappling, Aboriginal and non-Aboriginal, with The Grog. 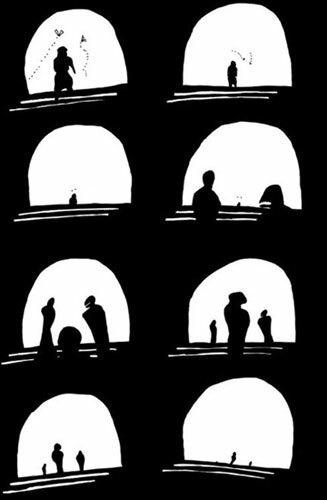 San Roque’s essay, ‘A long weekend’ – adapted and drawn by Joshua Santospirito to become the graphic novel – has a similar breakthrough quality. You read it and feel not quite so disarmed culturally for living in this place and moment. Some of what that essay points to is the potency for the ‘in-between space’ of tuning in to what’s happening ‘underground’. ‘A Book of Sand’ elaborates on this in San Roque’s poetic way – he comes at his subject through dreams, imagery, literature – ancient and contemporary – and his own fictions. You’re in this richly woven web before you know it, delivered from it briefly, before being drawn back in again. An incredibly enlivening reading experience. The art of psychotherapy that takes its line from C. G. Jung also takes direction from the practice of alchemy. Alchemy is an art of transformation, a river underground, a via oscura. I remember the dream of that day, perhaps the first or second analytic session in Devonshire Place in London, when the flooded chambers opened and I, first wading, then floating, began to descend through subterranean archways, drawn down by water that soon departed the archways and flowed further, deeper, south. Embarkation upon that subliminal stream incurs meetings in lost passages of time, passages of past experience that, incrementally, formed the homo sapiens brain – that layered, intricate thing. Left: Inanna (leaving the underworld), by Joshua Santospirito, from The Long Weekend in Alice Springs. It doesn’t surprise me to learn that Murphy’s work That’s Mparntwe, that’s town was made in an out-of-the-ordinary psychic state which he described as being in a kind of zone – a between state – where he felt like he was in the sky looking down but also on the ground looking up. The work manifests beautifully this departure from a single viewpoint, this fluidity that has to be part of a cultural re-imagining. And I see Mpetyane’s embrace of a modernist painting language as similarly culturally agile and highly communicative. San Roque talks directly about this necessary fluidity in his essay ‘The Lemon Tree’, included in the book he edited with others, called Placing Psyche. “Native Australians,” he writes, “call it ‘two-way thinking’, meaning the bi-partisan skill of making and managing connections across and along cultural borders.” A skill indispensable in regions like ours, where “seriously different cultural groups meet”. Such places are also referred to as “contact zones”. In an essay, ‘The Contact Zone as Imaginal Space’, from the same book, Jungian scholar Peter Bishop argues convincingly for recognition of their transformative, generative possibilities. Contact zones are typically found, he writes, in “contexts of highly asymmetrical relations of power, such as colonialism, slavery or their aftermaths”. But they also define “encounters with the land, including its flora, fauna”. I think we can instantly recognise the ways in which we here in Alice Springs, in Central Australia, are in an acute “contact zone” in both senses. The trouble is that most of the time this is thought about as describing a problem or a complex set of problems, full of conflict and suffering, which we find almost overwhelming. But, says Bishop, “contact zones also offer spaces where a decolonialising of cross-cultural communication and action can occur, where there can be alternative possibilities”. 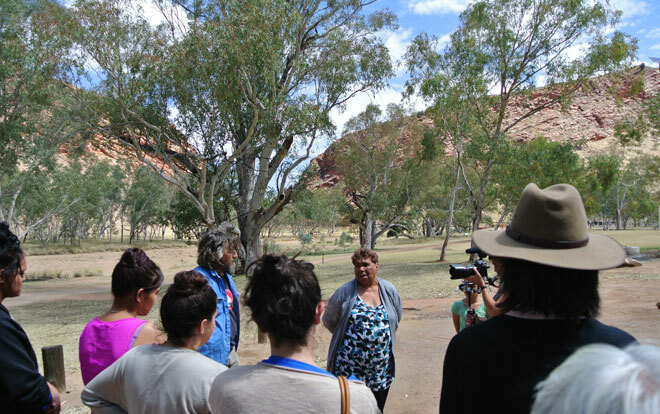 Above: Alternative possibilities – Doris Kngwarreye Stuart, Apmereke-artwye for Mparntwe, with non-Aboriginal collaborator Dan Murphy leading a tour for artists and students of sacred sites. 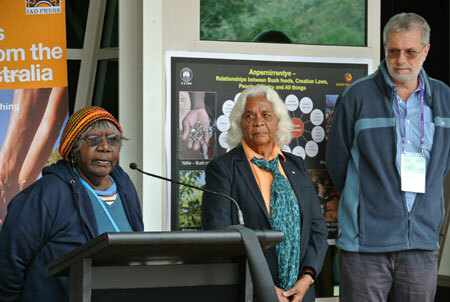 Left: Margaret Kemarre Turner with Veronica Dobson and John Henderson (the “Penangke man who worked on the big Arrernte dictionary”), here at the launch of Anpernirrentye – Kin and skin. 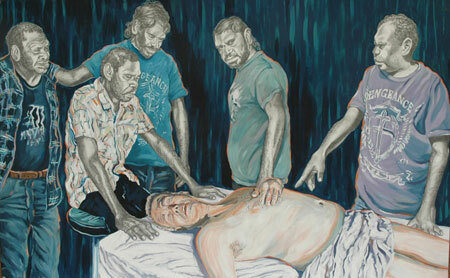 The relationship of Eastern Arrernte families, including Mrs Turner and her clan, with artist and author Rod Moss has a particular status in this discussion as it has engendered such a large body of work over a long period of time – Moss arrived in Alice in 1984 and began his connection with the Whitegate families in 1986, painting the seminal Stone Slingers the following year. In 2011 Moss and his work moved onto the national stage when his memoir, The Hard Light of Day (UQP), won the Prime Minister’s literary award for non-fiction. This was followed by a second volume of memoir, One thousand cuts (UQP, 2013). Among the finest of Moss’ individual paintings are works that foreground suffering, tapping the grief of his Arrernte friends’ as well as his own. 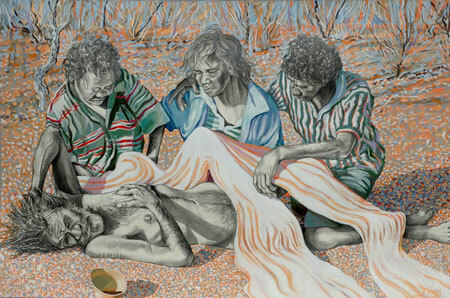 Funeral at Santa Teresa, 1993, for example, and Fallen Man, 2005 (at right), deal directly with death and dying. These are pre-eminently works that realise ‘alternative possibilities in the contact zone’, not only for their entry into Arrernte lives – the witness they bear – but for their offer of strength from Western tradition. Compositional sources are Courbet’s Burial at Ornans, 1850, and Bellini’s The Drunkenness of Noah, 1516. Whether or not we know or are told the art historical details, we recognise the sources subliminally. The front-on, triangular orchestration of figures is a Western archetypal frame for images of reverence, contemplation, mourning. This frame is significantly shared by Moss’ friends through their familiarity with Roman Catholic religious imagery. Moss’ ‘Madonna and child’ portraits, for example, are in great demand amongst them. His use of the frame lifts the scenes he records from the particular – as death and dying are great unifying human experiences – even while he stays unsparingly with the particular. In Fallen Man this is achieved through close confrontation. In Funeral at Santa Teresa it is through the riveting central placement of the old man – Moss’ great friend and Arrernte ‘father’, the late Mr Johnson – his head turned as if to deflect the blow of his loss (he was burying his daughter), but his frail chest offered up to it. Another important strand of Moss’ work shows something quite different – a vitality and warmth between the Arrernte and extended to him and his family. We see his friends going about daily life, in camp, or out on country, or in and around the streets of Alice. Games Alley, 1993 (below), is a great example. We see Moss’ son Raffi in the arms of the strapping Noelly Johnson, and young Devin Neil fairly bursting out of the painting in the foreground. Our response to this painting will be altered by knowledge of what later happened to Noelly (that is him, stricken, in Fallen Man) and to Devin (who died at 24) , in contrast to Raffi who continues to thrive. But this shouldn’t stop us from acknowledging a certain enduring strength in this group of Arrernte families, an aliveness, a readiness to revel in the moment, and a willingness to enter into relationship. Games Alley and numerous works in this strand are important acts of remembering what comes before and exists alongside the waste and the suffering. So relationship, bearing witness, eyes and heart open to the range of the experience, remembering, and drawing on his own cultural strength to make an offer, all this is strongly evidenced in Moss’ work in the contact zone. Then there’s also self-appraisal. There are several important paintings where the artist situates himself in the work. In Anatomy Lesson, 2012 he surrenders, body and soul, to his Arrernte friends, as if to ask, what do they make of me? Mrs Turner’s answer at the opening ceremony of his retrospective last year was simple and eloquent. She thanked him for “the beautiful images” even as she cried for so many recorded in them who have died, mostly before their time. His Arrernte friends have given Moss his subject matter, his impetus in art and much of his life; he has given them a record of their lives, country and enduring culture that they clearly value. A rich exchange, whose basic terms were put in the retrospective subtitle – “You. Me. Us.” – the terms and challenge of the contact zone. Continued/ – go to Part 3. Back to Part 1.